Both ermines (Mustela erminea) and mink (Mustela lutreola and Neovison vison) belong to the subfamily Mustelinae, which contains weasels, badgers, ferrets, polecats and wolverines. These two creatures share many features, but differ in several ways. Both are skilled hunters that feed on a variety of smaller creatures, including rodents and crustaceans. Ermines live in the northern half of the world, in Eurasia and North America. Their North American range includes most of Canada and most of the northern half of the United States except for the Great Plains. The European mink inhabits northeast Spain and throughout Europe. The American mink, on the other hand, inhabits almost all of the U.S.; its range also extends throughout most of Canada. Both European and American mink thrive in forested areas along the banks of streams, rivers and creeks. Mink are particularly capable in water and rely on water-dwelling creatures for much of their diet. Ermines, on the other hand, inhabit more open areas such as marshes and meadows adjacent to forests or along shrub lines. As indicated by their genera and subfamily, both ermines and mink display the characteristics of most weasels: long bodies, short legs, round ears, long tails and long whiskers. Both types of animal are sexually dimorphic, with the males being noticeably larger than the females. Ermines typically reach about 8 to 9.5 inches long and weigh between .8 and 4.5 ounces. Mink typically grow to between 19 and 28 inches and weigh up to 3.5 pounds. The ermine has two distinctive coats: a pure white coat in the winter and a brown coat with white chest and belly during the summer. The two coats also vary in thickness to help protect the small ermine's body during temperature extremes. It has a black cap on the end of its tail in both winter and summer. 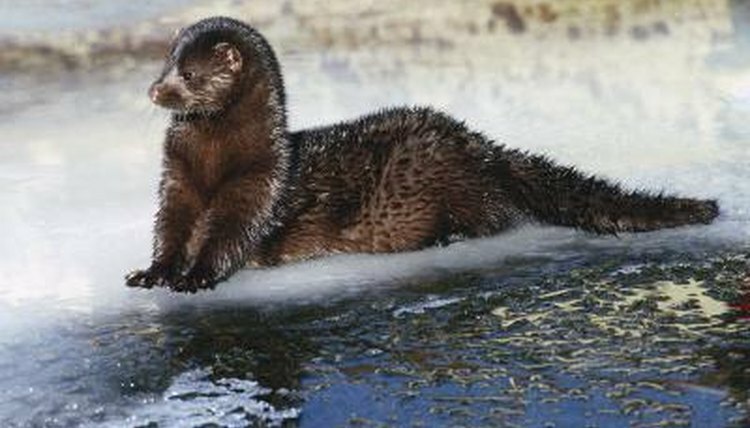 The mink, on the other hand, has an oily brown coat throughout the year, often with a small patch of white on the throat or chest.